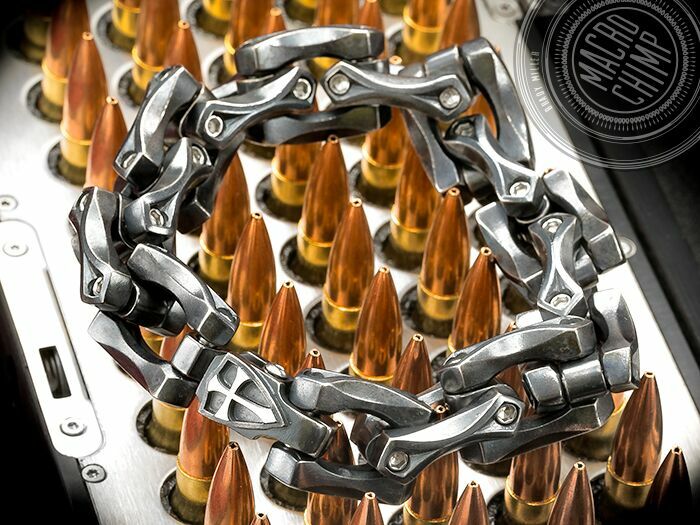 This extraordinary Sterling Silver Axe Link Bracelet by designer Derrick Obatake as seen in the Expendables movie is 9.625" in length and weighs in at 7.9 OZ Sterling Silver. Links are removable to fit smaller wrists. Derrick Obatake born and raised in East Los Angeles has been designing and making jewelry for over 35 years. At an early age he was taught to be a machinist by his father. He is a Graduate Gemologist from GIA and has had formal training in traditional jewelry arts: Diamond setting, model making, casting, finishing and fabrication. He has extended experience in Die striking, and 3D CAD design. The parent company of Steel Flame®, Elements has been in business for over 20 years. Elements has sold custom product through over 500 retailers nationally and has been an approved drop ship vendor for corporations like Nordstrom, Disney, Warner Bros, Amway and Lands End. We take pride in designing and manufacturing in the United States using quality materials from US suppliers.